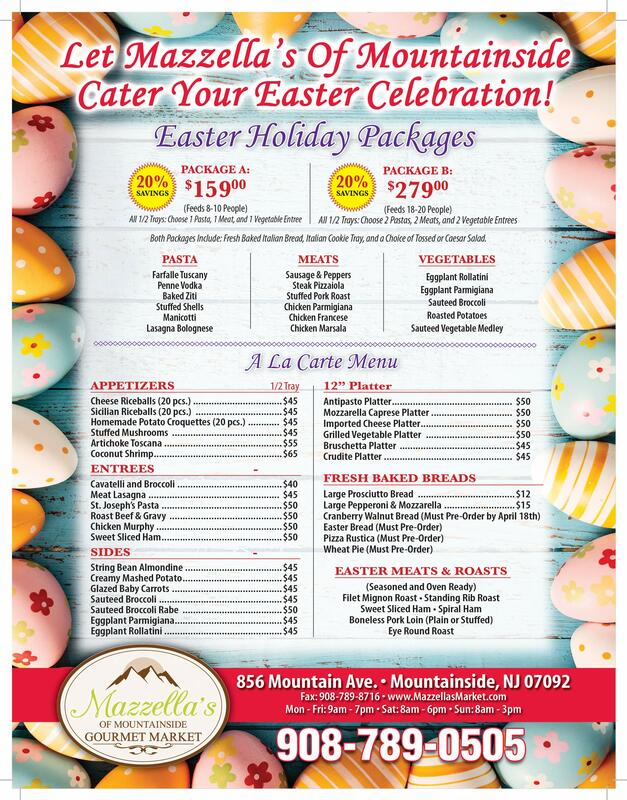 Proudly Offering catering services, prime cuts of meat and gourmet prepared foods to Mountainside, NJ | Right Next to Westfield, NJ! Mazzella's Gourmet Market is your one stop shop in Mountainside and Westfield, NJ, for gourmet prepared foods, Italian delicacies and delicious meats and cheeses. If you are looking for homemade mozzarella or delicious imported provolone, you have come to the right place! Give us a call or come by to try any of our delicious prepared foods, or to place an order for us to cater your next event! If you are looking for a complete selection of premium cuts of meat, you have come to the right place! Mazzella's Gourmet Market offers certified Angus beef, Bell & Evans Poultry, homemade Italian sausage and a whole lot more. Come by today to pick up your quality cuts of meat, and we guarantee you'll be coming back for more! In addition to our prime cuts of meat and imported Italian cheeses, we offer a wide selection of gourmet prepared foods, Italian desserts and delicacies. Our prepared foods are perfect for a hassle free delicious dinner or to bring to your next gathering or potluck. Why buy pre packaged foods? Our deli prepares everything from scratch and makes every dish with the freshest ingredients in the Mountainside and Westfield, NJ area. 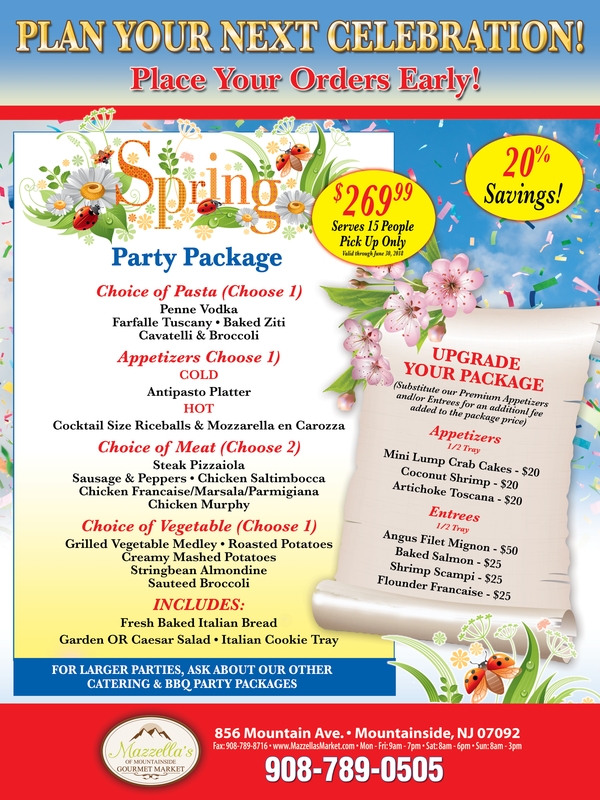 If you are planning a large event and want a worry-free and delicious meal option, count on Mazzella's catering. All of our packages are customized specifically to you and your event. From small gatherings to large weddings, we have the food that will guarantee you guests will be wanting more. Choose from a wide range of main courses as well as delicious Italian desserts. Our Hot and Cold Catering menu and our Holiday Catering menus will sure be a huge hit any event in Mountainside, Westfield, NJ, or surrounding areas. We know you will be satisfied! By signing up you will get exclusive offers, new product announcements, updates on store events and more! Swing by our convenient location at 856 Mountain Ave. in Mountainside, NJ, or give us a call at (908) 789-0505. We would be happy to give you more information about our catering services or go over any of our delicious, gourmet-prepared food items. Copyright © 2019 Mazzella's Gourmet Market, all rights reserved.